Bad movies can happen to good people. Most folks go into making a film with the best of intentions and hoping to churn out a cinematic classic of some sort. What most don’t anticipate is their film becoming a flop, or the collaborative effort failing and leaving a mishmash of a movie that immediately destroys whatever artistic aims were once guiding the project. 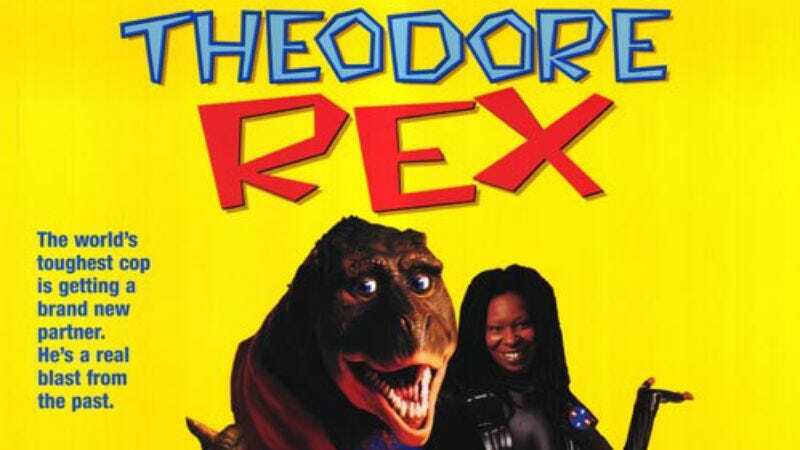 Of course, when your film is a sci-fi cop movie with a talking tyrannosaurus rex and a wisecracking Whoopi Goldberg, perhaps it’s always fated to be a troubled production. Over at /Film, and in conjunction with the How Did This Get Made? podcast, Blake Harris interviewed several of the principles involved in making Theodore Rex. This is the second installment of taking the podcast—mostly used for calling out films for being “bonkers” and “hot garbage” by hosts Paul Scheer, Jason Mantzoukas, and June Diane Raphael—and then actually filling in the gaps of the production. The first installment centered around the “Chuck Norris and his dog partner” film, Top Dog. My dad had actually cut me off years earlier because of my professional and lifestyle choices. At the time, I was living off my wife’s modeling money and the residuals from an aerobics TV show I had made for Italian television. Anyway, I read the script for T-Rex—by the way, the film used to be called T-Rex so I’m going to refer to it as that—and I have to say it was really, really a good script. Now, I can guess what you are thinking, but at this stage the script was a really a gritty sci-fi story. It was a dark, futuristic buddy cop movie, but where one of the buddies just happened to be a dinosaur. The three eventually land Whoopi Goldberg, and with that comes a lot of arbitration and lawsuits, and then tinkering from outside forces. It’s a fascinating read that chronicles how something can go from the best (if ill-conceived) intentions and turn into the largest-budgeted direct-to-video bust ever made. Through his interviews, Harris is able to sketch out how even a dinosaur-buddy-cop movie can have serious beginnings, dark moments in the production, and weird drama attached to its making.